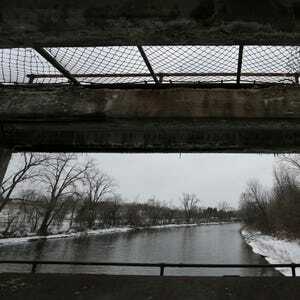 LANSING — The Houston engineering firm that was hired to get the Flint water treatment plant ready to treat water from the Flint River so residents could drink it denies responsibility for the disastrous decision not to use corrosion control chemicals in the treatment process. A spokesman for Lockwood, Andrews & Newman (LAN) said the decision was made by the City of Flint and the Michigan Department of Environmental Quality. The lack of a corrosion control program — sometimes known as optimization for lead — is the reason the corrosive Flint River water was able to remove a protective coating and eat into lead pipes, joints and fixtures, sending unsafe levels of the toxic metal into Flint households and poisoning an unknown number of Flint children and other residents. Experts have said the addition of corrosion control chemicals such as phosphates was a basic requirement under the circumstances and have said they are mystified why those chemicals were not used. The Free Press reported Tuesday that former Flint public works director Howard Croft said in a Sept. 3 e-mail, obtained under Michigan’s Freedom of Information Act, that “optimization for lead was addressed and discussed with the engineering firm and with the DEQ,” but officials decided to hold off on adding the chemicals because of concerns they would increase bacteria counts in the water. LAN, which has an office in Flint, “was asked to provide a limited scope of engineering services to address specific components of the existing water treatment plant, not the overall water quality,” Wentz said. “The systems we provided services on are operating without issue, and it is clear that LAN provided these specific services in a responsible and appropriate manner in accordance with industry standards. Wentz did not provide a direct answer when asked whether LAN participated in corrosion control discussions with the city and the DEQ, but said those two parties made the decision. State and city officials have not been clear about their roles in the decision. LAN is named as a defendant in a proposed class action filed over the lead contamination. The suit, filed in Genesee County Circuit Court by Auburn Hills attorney Mark McAlpine on behalf of a group of Flint residents, accuses LAN of professional negligence, which the company denies. “We believe that this lawsuit has no merit and will vigorously defend our position in court,” Wentz said. Contact Paul Egan: 517:372-8660 or pegan@freepress.com. Follow him on Twitter @paulegan4.